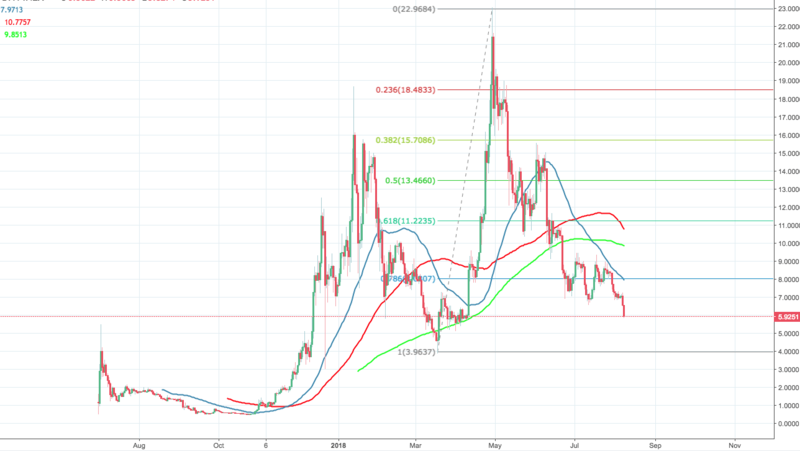 EOS drops below critical support at $6.00; more downside may be in store. Bearish sentiments and technical factors drive EOS. EOS, the 5th largest coin with the market cap $5.5B is changing hands at $6.1 ant the time of writing, down 12% on a daily basis the downside is gaining traction, though there are no EOS specific significant triggers readily available to explain the sell-off. The coin has experienced the most profound daily loss in percentage terms since July 9 and shed $800M of its value in a single day amid growing trading volumes. EOS is down over 70% from its peak reached at $22.98 on April 29. Looking technically, EOS/USD the next critical support level comes at $5.0. If it gives way, the downside momentum may gain traction to take the coin towards $3.8, which is the lowest level since March 18. On the upside, the bulls have to regain $6.0 handle to mitigate immediate bearish pressure with $7.0 being the next critical level. It served as good support for EOS since mid-July.